Squirrels can be busy little fellas, living out their lives running around gathering and hoarding food, mating and raising young. With all that scrambling, sleep is an integral part of squirrel's lives. Squirrels' sleep habits differ among species, generally according to whether they're ground squirrels or tree squirrels. This determines where they spend most of their lives as well as where they retreat to for sleep. For a tree squirrel, getting some shut-eye requires a cozy den. Many squirrels, including the gray squirrel, the fox squirrel and the red squirrel, create their dens in the sides of trees. They spruce up their digs with bedding such as moss or leaves. Many squirrels resort to using dens for long winters. During warmer months, a dray may serve for sleep and for raising babies. A dray consists of leaves and twigs arranged as a nest and tucked away in the branches of a tree. Many species of squirrels go about their business during the daytime and reserve nighttime for catching up on sleep. When a squirrel isn't running around looking for nuts or scampering about in trees, she may be found underground in her burrow caring for her young or sleeping at night. Tree squirrels will call it a day by heading to their dens or drays. Ground squirrels shield themselves from cold winters by retreating to their dens for long hibernation periods, usually about five months. During this time, the squirrel's body temperature lowers to just a couple degrees higher than the outside temperature. Breathing and heart rate will slow down during hibernation and a long, restful sleep will take place. Each week, a hibernating squirrel will wake up for 12 to 20 hours. 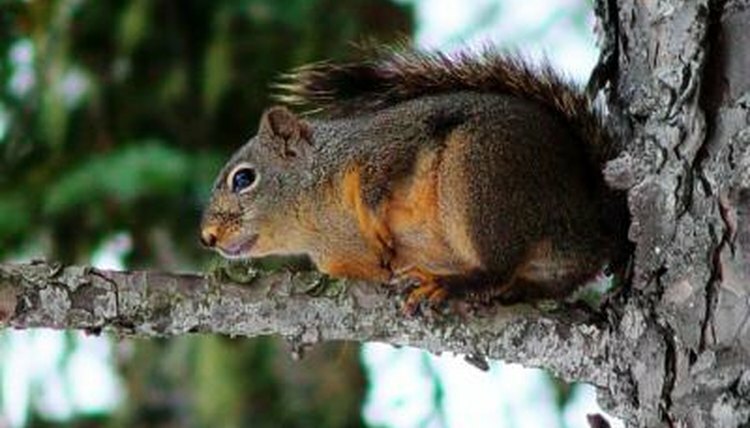 Tree squirrels don't engage in hibernation like their ground squirrel counterparts. Instead, they build nests and try to stay warm during the winter months remaining active. Squirrels who live in very hot climates get away from the heat for a while in hibernationlike periods in the warm summer months known as estivation. Estivation can last for seven months. Burrows hidden away from the hot sunlight and close to the ground, providing for a cooler climate, are used for estivating. High Planes Journal: Where Do Squirrels Sleep at Night? What Is a Squirrel Drey? What Do Squirrels Do in the Cold?